Minister of Power, Works and Housing, Babatunde Fashola with former Super Eagles coach, Bonfrere Jo, on Wednesday, June 6, 2018. The Federal Government has fulfilled its promise of building a house for former Super Eagles coach Bonfrere Jo. 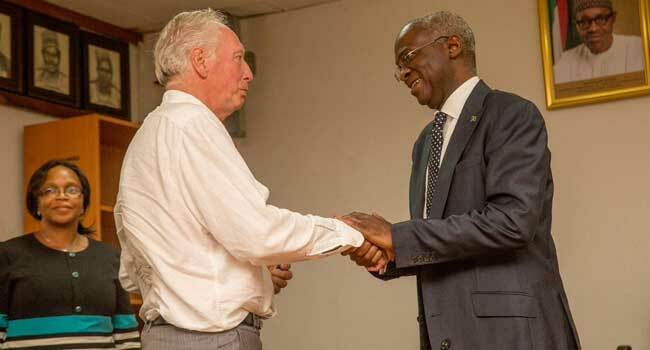 Minister of Power, Works and Housing, Babatunde Fashola (SAN), handed over the keys to a three-bedroom apartment in Gwagwalada, Abuja to the Dutchman on Tuesday. In handing over the keys at a ceremony in the nation’s capital, the Federal Government fulfilled the pledge made to the coach after he guided the national U23 team to victory at the 1996 Olympic Games in Atlanta. The minister thanked the Dutchman for his contribution and expects the move to inspire the Super Eagles at the World Cup. He said, “Let me on behalf of the President apologise to you that it has taken so long for the Nigerian government to come through. We thank you for your contribution to the development of our country, our youth, football and to say that it is better late than never. Nigeria always come through, we have come through for you. For Fashola, the fulfilment of the promise reflects the commitment of the current administration to keeping its promises to citizens. “Ordinarily, this ought to be a short meeting but if it takes 24 years for the government of the country to respond to its citizens, it must assume a news-making event,” he said. A thankful Bonfrere Jo, who is now 74, also wished the Super Eagles success at the World Cup.